Settle in at San Antonios luxury landmark, nestled on a romantic bend of the city's famed River Walk. Stroll in the shade of cypress and palm trees, moments from the Alamo, La Villita historic village, and the San Antonio Convention Center. Energize in the WestinWORKOUT Fitness Studio or take in the sights with RunWESTIN . Transition from day to evening at La Merienda with signature cocktails and complimentary crudit s. Rejuvenate with a soothing treatment in our Woodhouse Day Spa . Our 473 rooms and suites welcome you with Texan hospitality and warm residential style. All rooms feature the signature Westin Heavenly Bed, sparkling city or river views, and elegant, oversized marble bathrooms with pampering bath amenities. 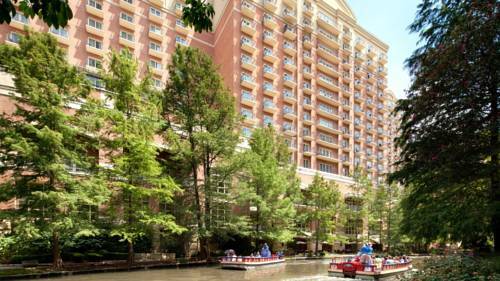 The Westin Riverwalk, San Antonio offers guests direct access to one of the most charming and beloved Texas destinations. Whether you set out on foot or by water taxi, the hotel's location overlooking the River Walk invites you to explore the myriad restaurants, shops and entertainment venues that line the banks of the San Antonio River as it winds through downtown. Wander a bit further and you'll discover rich sites of culture and the arts. Breathe in some Texas history at The Alamo and the Spanish Governors Palace, stroll through Market Square and La Villita, San Antonio's historic arts village, or sip a cold microbrew at the Historic Pearl Brewery. The hotel is also within easy reach of both the cutting-edge Blue Star Arts Complex and the San Antonio Convention Center. Great family attractions, including the San Antonio Zoo and Six Flags Fiesta Texas, are just short trips from the hotel. The cabana-style rooftop pool bar is an ideal place to relax and sip a minty Mojito, San Antonio-style. It's the perfect oasis to socialize, enjoy a light snack, and soak in views of the Tower of America and the River Walk. Indulge in sophisticated Italian fare with a rustic touch in the inviting atmosphere of Zocca Cuisine D Italia. Our flagship restaurant is one of the city s most exciting dining destinations, with all-day dining indoors or on the riverfront patio. Just off the hotel's grand lobby, Cafecito serves breakfast and lunch to go, including Starbucks coffee and espresso drinks, tempting pastries, savory paninis and more. Rustic wooden tables and leather chairs lend a refined charm to the caf . - Theatre of Wax and Ripley's Believe It or Not!